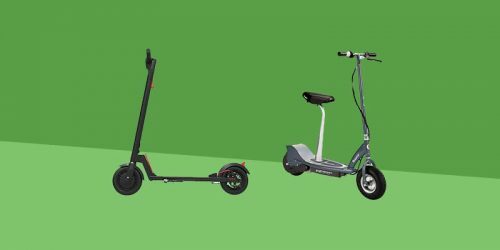 NANROBOT is a Chinese company with upwards of 15 electric scooters on the market right now, and their fastest scooter, the RS7, even made it onto our list of fastest electric scooters out right now. The D4+ has been thrown into popularity because of its powerful motors and impressive features, and has excited us (if not scared us a little) with its power output and range. At first glance this scooter looks like it means business, so let’s get into it and see if it holds up. The NANROBOT D4+ is a fast, powerful, robust electric scooter that will get you to work in record time – I’d personally recommend being very careful if you attempt to reach the top speed of 40 mph. 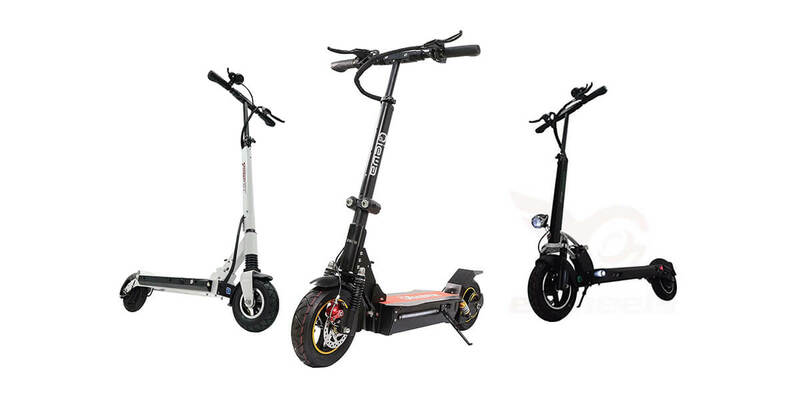 The scooter has two impressive 1000 Watt motors, one in each wheel, and a range of 70 km (44 miles). The wheels have sensitive dual disc brakes, along with 10” pneumatic tires and shock absorbers (Which are very much needed if you are planning on going off road with this). This scooter comes with a few nice features, namely an LCD display and LED headlight and taillight, as well as a seat that can be purchased separately or with the D4+. The NANROBOT isn’t jam packed full of features like some electric scooters that seem to be being churned directly out of silicon valley on a conveyor belt, however it does have the essentials that can be relied on to do their job properly. The D4+ has a front LED headlight and a rear taillight. These are both pretty bright, so night riding is definitely on the cards, you won’t have to worry about oncoming traffic being unable to see you. 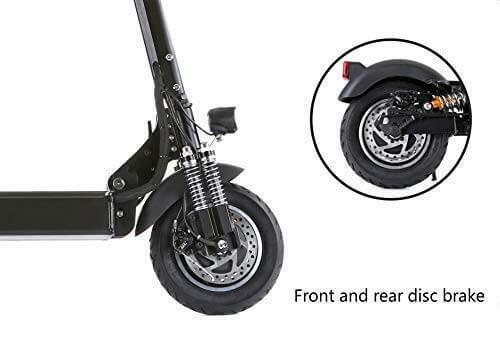 With reasonable tread on the tires and 6 shock absorbers built into the scooter, this scooter has great shock absorption and reliable anti-slip tires. Due to this we’d be happy to go off road, on dirt or gravel. The D4+ has an IP53 rating, meaning it it protected against dust and spraying water, so for obvious safety reasons we wouldn’t recommend taking this out in torrential rain. The LCD display outputs statistics such as speed and battery life, close by is the trigger throttle and a handy USB port. 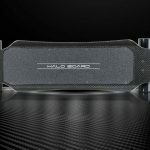 The NANROBOT has an Eco/Turbo mode which allows you to choose between speed and range. Last but not least, it has a kickstand! 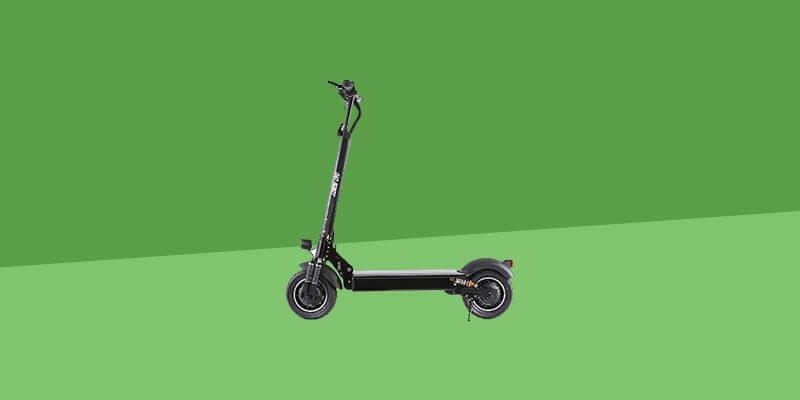 With an intimidating aluminium frame, 10” wheels and a high capacity 52V 23Ah lithium battery, this scooter is pretty industrial. This high capacity battery powers the Eco/Turbo mode, with Turbo mode reaching 65 km/h. 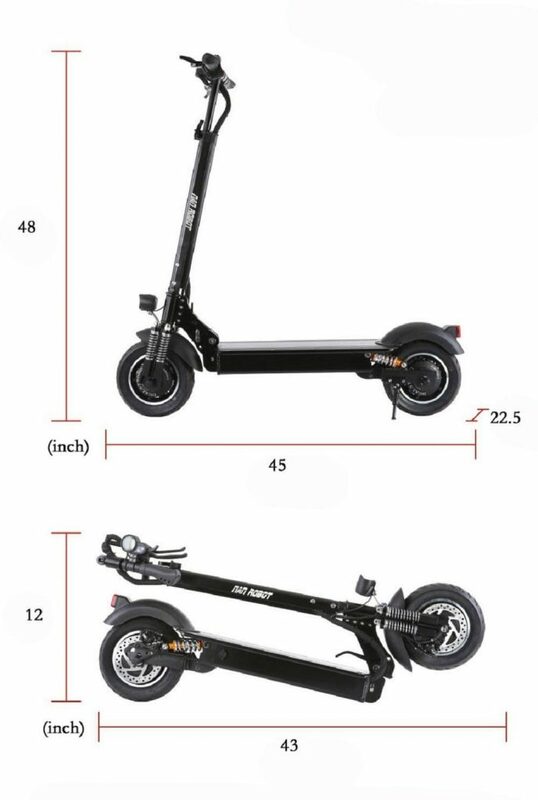 I’d say it’s entirely possible to take this scooter on different terrains without worrying, and as a bonus both wheels are encased by fenders to prevent dirt spray when travelling off-road. It weighs 27kg, so it isn’t light, has upright dimensions of 122 x 114 x 57cm, and folded dimensions of 30 x 110 x 57cm. 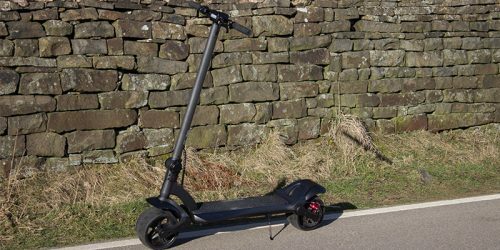 In my opinion, this scooter is not ideal for the ‘last mile’ commuters, or anyone who feels they’ll be awkwardly lugging it on and off public transport. It is too bulky and heavy for that, rather it should be used for someone who’s going to use it to cover large distances. The deck is relatively wide so it’s perfect for anyone who’s had past experiences of scooters with cramped foot space and wants to know they’ll be standing comfortably. The 6 shock absorbers are spread out, with 4 on the front wheel and 2 on the rear wheel. One of the first things you notice when you step on the NANROBOT D4+ is the single/dual button. 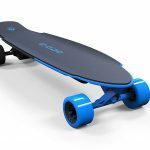 This is a great addition for those who want more choice and control when riding, and lets you choose between one or both motors being on and functioning (1000 Watts or 2000 Watts), allowing you to essentially pick how much power you want out of your scooter. When both motors are on, you get a 2000 Watt output, and at full force, this scooter gets to 40 mph. 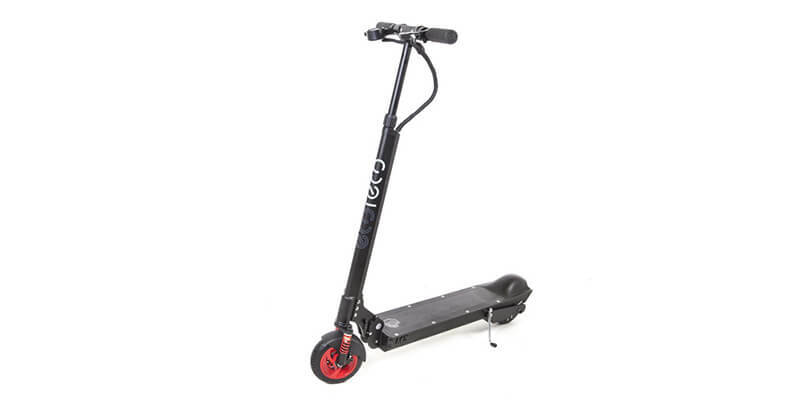 Regardless of what the electric scooter regulation is like in the area you live in, I would restrain from hitting this top speed unless you’re confident in your ability and you’re far away from any pedestrians – because this thing goes fast. In addition to this, the dual disc brakes definitely work, in fact I’d say if you were unprepared for this and attempted to stop going at full speed you’d potentially go head first over the handlebars. This can be partially attributed to the regenerative braking, which is necessary when going at such high speeds, I’d however recommend being prepared for this. With all this power you’d be disappointed if this scooter couldn’t tackle hills. Well you’ve got nothing to worry about, if you take on a hill with dual motor output you can easily get yourself up a 30° incline! You’ll be happy to know you can make good use of the shock absorbers, with the 10” pneumatic tires being more than capable of taking you off-road and the aluminium frame is robust enough to make you feel secure and safe when going over bumpy terrain. The battery will keep you going for about 45 miles, terrain permitting, this is quite impressive and comes out at twice the range of your generic electric scooter. Once the D4+ is completely out of juice it’ll take around 8-10 hours to fully recharge. 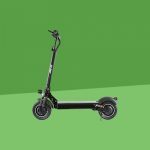 Range – This scooter can often go twice as far as many top range electric scooters available right now, with 45 miles in the bag this could be very tempting to a lot of people looking for a scooter with a bit more range. 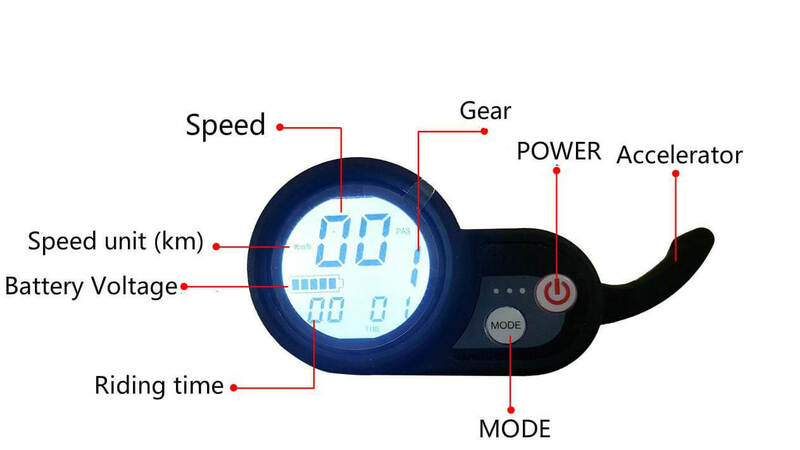 Power Output – This power output is great for a number of reasons, such as giving the scooter an insane top speed, and getting you up relatively speed hills with little to no trouble. 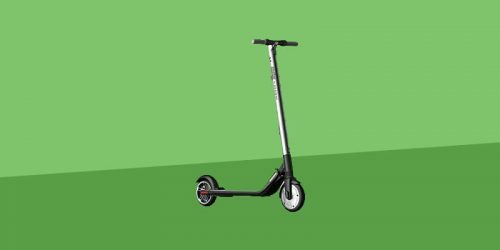 Price – Although this scooter is impressive in a number of ways, you’ll also have to fork out over $1,200, we’d like to see this price come down at some point. With all of this information it’s clear that this scooter is a bit of a tank. 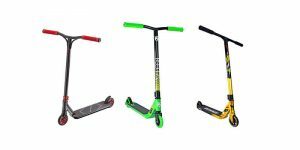 The range, top speed and overall build of the D4+ proves that it isn’t for the faint of heart, and I’d verge on saying this scooter is dangerous, especially if you don’t know what you’re doing. However, with that said, if you’re looking for something powerful and fast, you can’t go wrong here. 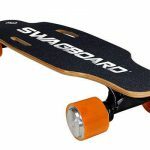 The NANROBOT has the performance as well as the essentials such as headlights and fully functioning LCD display, and can be used as a commuter or something recreational for the thrill-seekers!